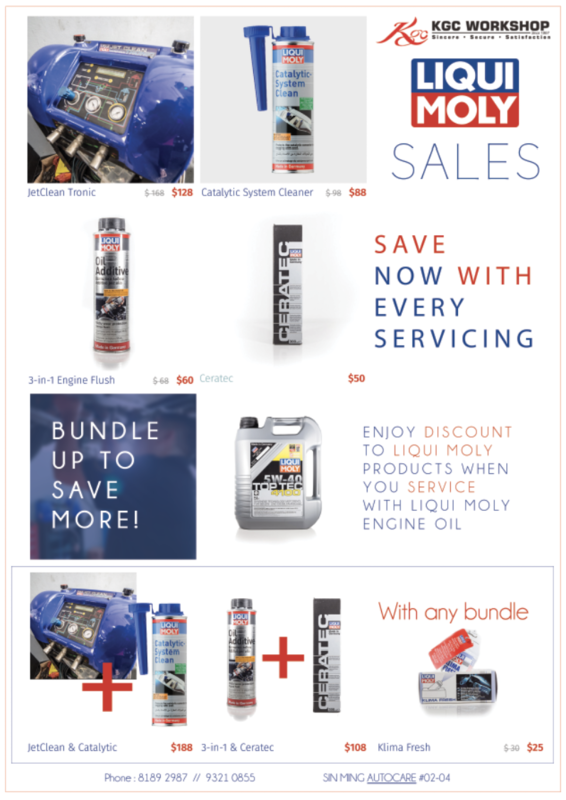 > Blog>Promotions>Liqui Moly Car Servicing Purchase with Purchase Promotions! Save big on your car servicing in Singapore now with our Liqui Moly Purchase with purchase promotions! Being one of the biggest name in the automotive world, you often see their logos in Formula 1 and MotorGP races. Liqui Moly has been providing with quality engine oil and many other products that goes along with your automotive maintenance. To provide quality one-stop automotive workshop, we often work with one of the best in the industry. This time, we partnered up with Liqui Moly Singapore, to bring you the best deal available, for you to save on your maintenances and also, to try Liqui Moly products, if you haven’t already done so. If you do not know, Liqui Moly provides not only quality engine oil, they also provides a wide range of products such as JetClean Tronic, Catalytic System Cleaner, 3-in-1 Engine Flush, Ceratec. JetClean Tronic cleans all carburetion and injection system. Which means it helps to clean off the carbon that are stuck in your engine with the special solution that dissolve the carbons effectively. It helps to bring back your horsepower that were lost, better fuel efficiency and helps to prevent the need to overhaul your engine. Liqui Moly Catalytic System Cleaner is a new product that helps to protects the catalytic converter from clogging with soot. It also helps to clean the intake valves and the combustion chamber which helps to improves the combustion of the fuel. 3-in-1 Engine Flush cleans the engine by allowing solid and liquid contaminants to freely drain with the “old” engine oil. It removes harmful deposits and residues and keeps oil screens and sprayers free of blockages and prevents oil starvation to working parts. Liqui Moly CeraTec is a high-tech ceramic wear protection product for all motor oils. XeraTec reduces friction and wear due to ceramic compounds that withstand extremely high chemical and thermal loads. It helps to reduces engine friction, increase engine service life and also improves fuel consumption. Don’t miss out on the promotions! To enjoy the promotion, simply choose any of the suitable engine Liqui Moly engine oil for you car servicing. With every Liqui Moly servicing, you’ll be entitled to the following discount! Liqui Moly CeraTec at only $50! Bundle up the additional services to save even more! With any of the bundle service purchased, you’ll be entitled to have Liqui Moly Klima Fresh at $25 only. Originally priced at $30. Limited to the first 50 customers only.